Off the shores of the American coast, the wrecks of ill-fated seafaring vessels can be found miles beneath the water’s surface. Many of these shipwrecks, discovered over the centuries by avid underwater explorers, have contained significant amounts of gold, precious artifacts, and other treasures, worth millions today. Here, we talk about five of these valuable famous shipwrecks off the US coast. Wrecked off the coast of the Florida Keys in 1622, the Nuestra Señora de Atocha is the most valuable shipwreck to ever be recovered to date. A Spanish ship originally bound from Havana, Cuba to Spain, the Atocha had spent the summer of 1622 in Veracruz, Mexico loading and logging a hefty amount of treasure, ranging from copper and gems to gold and indigo from the Spanish colonies. However, shortly after the Atocha launched from port, a major hurricane caught the ship outside of Havana, Cuba on September 4, 1622. The hurricane destroyed the Atocha, which sank 56 feet beneath the surface on September 6, 1622, along with several other ships in the Spanish fleet. Only three sailors and two slaves survived the Atocha’s sinking, clinging to the ship’s mizzen-mast. A treasurer salvager with gold and silver bars recovered from the Atocha shipwreck. Reprinted from Florida’s Shipwrecks by Michael Barnette courtesy of Robert Weller (pg. 31, Arcadia Publishing, 2008). Unsurprisingly, the treasure aboard the Atocha also sank with the ship, which the Spanish were eager to recover. Sending slaves down to the shipwreck in a brass chamber called a diving bell, slaves were expected to exit the diving bell, retrieve items from the ship, and return to the bell before being pulled to the surface. The Spanish made many of these attempts, and the practice was not only usually lethal for the slaves (who were written off by ship captain’s as “business costs”), but also succeeded in recovering less than half of the ship’s cargo. 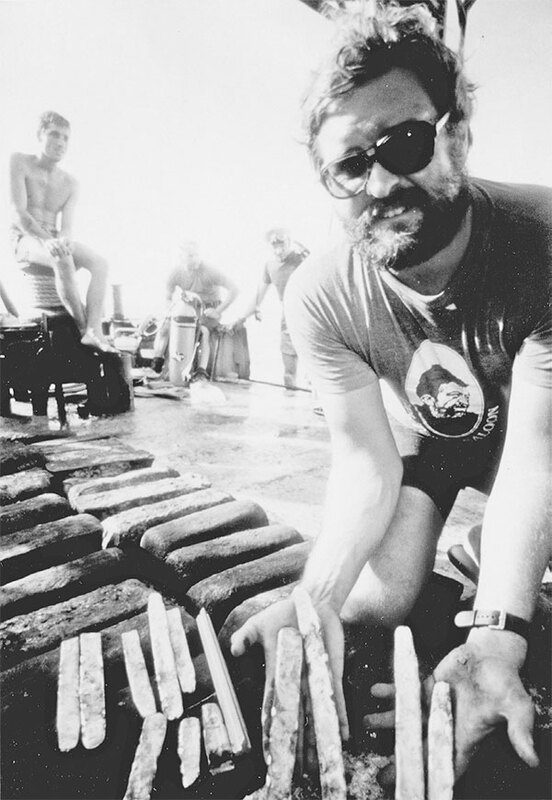 After the Spanish ceased these diving missions, the Atocha shipwreck was lost until 1985, when treasure hunters Mel Fisher and Rinley Ricard rediscovered the wreck off the coast of the Florida Keys. While some of the ship’s most valuable cargo (such as rare Muzo emeralds) are still missing, Fisher and Ricard were able to recover both hard to find and previously unknown coins, amongst other artifacts. Today, the Atocha is still being excavated, and new artifacts are found semi-regularly. In 2011, treasure divers were able to find an emerald ring from the wreck, which was valued at $500,000 USD alone. They also found spoons and other artifacts. Currently holding a Guinness World Record for its recovered value (as it was carrying 40 tons of gold and silver, and 71 pounds of emeralds), the Atocha is located only 35 miles from the Florida Keys’ coast, and is a continual treasure trove for divers and fortune hunters alike. An American ship that spent time serving both the US and Confederate governments, the SS Republic sank in 1865 during a hurricane off the coast of Georgia. Originally commissioned as a merchant vessel, the Republic was trapped in the port at New Orleans, Louisiana at the beginning of the Civil War, when it was seized by the Confederacy for use as a blockade runner. It subsequently became a Union ship after New Orleans was seized by Union forces. After the Civil War, the Republic returned to civilian voyages, carrying both passengers and cargo along a route from New York to New Orleans. On the ship’s fifth civilian voyage, it was tasked with carrying both passengers and $400,000 USD in cargo, and left port from New York bound towards Louisiana on October 20, 1865. However, on the fifth day of the ship’s trek, disaster struck: A hurricane off the coast of Georgia damaged the ship’s hull, causing a leak, and the Republic quickly began to take on water. After this water put out the fire in the ship’s boiler, it stalled in the middle of the hurricane, and began taking on massive amounts of water, much faster than could be bailed by crew and passengers. The ship consequently sank around four in the afternoon. Most of the passengers and crew of the Republic were luckily able to survive this catastrophe, escaping the ship on four lifeboats and a makeshift raft. They were not found until two days later, when a passing ship searching for the Republic was able to find them. While several on the raft were lost in 40 foot seas, the majority of passengers and crew survived, and were transported to Charleston, South Carolina. As a result of the sinking, the cargo (which had mostly been hard currency in the form of coins) was lost with the ship until 2003, when a commercial archaeology company rediscovered the wreck approximately 100 miles from Savannah, Georgia. About a third of the coins that were on board the ship have been recovered, and are now valued at over $75 million USD. Many of the artifacts and coins from the Republic can be viewed in museums around the country. A Confederate steamer, the SS Georgiana was rumored to be the “most powerful” ship in the Confederate fleet. Built in Scotland, the ship sailed its maiden voyage in 1863 for Charleston, South Carolina, where it was expected to be outfitted by Confederate soldiers. Able to hold between 16 and 22 guns on board, the ship would be one of the best armed vessels of its time. However, the Georgiana was not armed with any guns on its first journey from Scotland to Charleston, which had been stored in the hold until reaching the Confederate port. Under the command of British Captain A.B. Davidson, the Georgiana approached Charleston on March 19, 1863 with little defenses, only to be met by the yacht America. The America was a member of a Union blockade set to keep Confederate ships from reaching the Charleston harbor, and it quickly alerted nearby battleship USS Wissahickon to the Georgiana’s approach. Unfortunately for the Georgiana, the Wissahickon was armed with large guns, which quickly shot and pierced both sides of the newly minted ship’s hull. 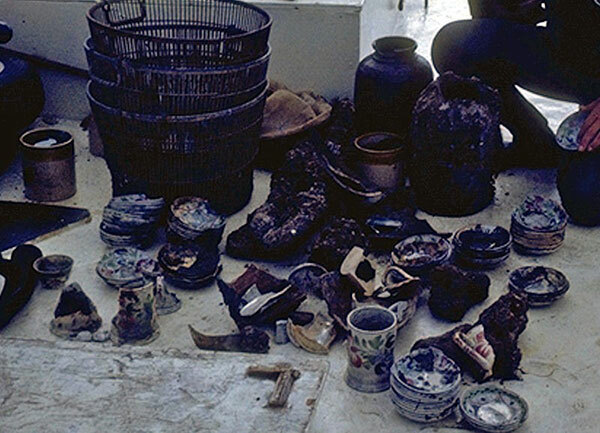 Artifacts recovered from the wreckage of the SS Georgiana and Mary Bowers. Image by E. Lee Spence [CC BY-SA 3.0], via Wikimedia Commons. The shots caused the Georgiana to quickly begin taking on water, and also destroyed the ship’s propeller and rudder. Captain Davidson, acknowledging that the ship had little hope of reaching port, signaled a surrender to the Union blockade before beaching the boat in just fourteen feet of water. Before the beached ship could be boarded (and its crew taken as prize in the surrender), however, Davidson purposefully sank (or scuttled) the boat, before escaping to land with his entire crew. The loss of the Georgiana infuriated the blockade ships, who would have been able to share any reward for capturing the Confederate steamer. In response, the Wissahickon set the shipwreck on fire to prevent any looters from salvaging the ship’s cargo. After burning and taking on water for several days, the Georgiana was finally lost. The ship’s whereabouts remained unknown until 1965, when famed underwater archaeologist E. Lee Spence discovered the wreck at just 18 years old. Found on March 19, 1965, the Georgiana was lost for exactly 102 years before its discovery. Since then, the Georgiana has been excavated several times, and artifacts from the wreck have been valued at over $12,000,000 USD. The ship was also rumored to have about $15,000,000 USD worth of gold on board, though this has never been found. Overall, the value of the ship’s recovered and rumored cargo is believed to be approximately $50,000,000 USD. Originally intended as a passenger, cargo, and slave ship, the Whydah Gally was intended for service in the Britsh Empire before it was captured during its maiden voyage by notorious pirate Samuel “Black Sam” Bellamy. Bellamy, who had turned to piracy during the fall of 1716, was rumored to have become a pirate to build a fortune to marry Maria Hallett, a young woman he met while visiting relatives in Cape Cod. Bellamy’s greatest conquest came with the Whydah Gally, which he captured from Captain Lawrence Prince. Knowing that Bellamy meant to capture his ship, Lawrence surrendered the Whydah Gally after just one shot from the pirate. True to his generous form, Bellamy traded Lawrence the ship Sultana for Lawrence’s Whydah Gally, outfitting the latter as his new flagship before the crew set sail back home to New England. If Maria Hallett, Bellamy’s bride to be, was in fact waiting for Samuel Bellamy to return to her, then she would have certainly seen her lover’s fate from the shores of Cape Cod. As Bellamy and his crew approached the Massachusetts coast the weather turned, creating a violent nor’easter cyclone. Storms like Bellamy’s are notorious for producing heavy rains and snow, making them extremely dangerous to ships. The strength of the storm caused the Whydah Gally to strike a sandbar during its approach, beaching it less than a mile from Marconi Beach, near Wellfleet, Massachusetts. After being beaten by relentless 70 mile per hour winds, the main mast of the Whydah Gally snapped, causing the ship to capsize. The cargo of the ship and its 144-man crew and captain were consequently thrust into the sea. By the next morning, the bodies of many of the men had washed up to shore. 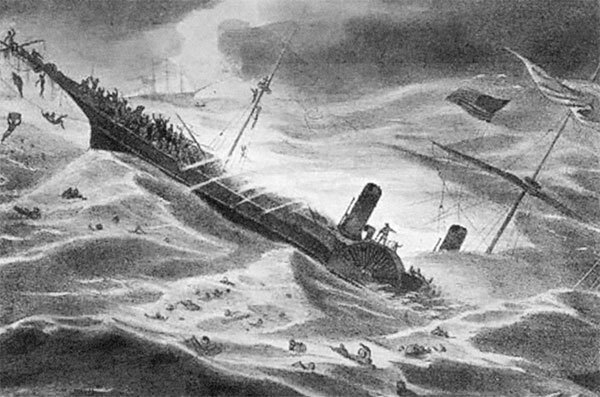 In total, only two men survived the sinking, and forty bodies (including Bellamy’s) were never recovered. The ship’s location was subsequently lost, and it quickly fell into local legend, where it was considered little more than a fable for centuries until its rediscovery in 1984. Relying on a 1717 map claiming to show the location of Bellamy’s ship, underwater archaeologist Barry Clifford discovered the Whydah Gally under only 14 feet of water and 5 feet of sand. Since its rediscovery, more than 200,000 individual artifacts have been retrieved from the ship, including the ship’s bell, which was inscribed with “THE WHYDAH GALLY 1716.” This helped to authenticate the Whydah as the first pirate shipwreck to ever be found and confirmed. Today, the shipwreck is valued at $400 million USD, and its artifacts are largely on display at the Whydah Pirate Museum in West Yarmouth, Massachusetts. Also known as the “Ship of Gold,” the SS Central America was an American sidewheel steamer that operated between the East Coast and Central America. Primarily a mail ship, the Central America was tasked in September 1857 with carrying 477 passengers, 101 crewmembers, 38,000 pieces of mail, and 30,000 pounds of gold harvested during the California Gold Rush to New York City from Panama. Leaving the port of Colón on September 3, 1857, the Central America made a quick but perhaps damning stop in Havana, Cuba, before continuing north under the guidance of Captain William Lewis Herndon. The arrival of Herndon’s ship was highly anticipated in New York, as the gold excavated from the Gold Rush was expected to help assuage the impact of the year’s rather weak economy, and allay public fears of an impending economic depression. However, before it could deliver the promised gold, the Central America was engulfed by a Category 2 hurricane off the coast of the Carolinas. The hurricane carried 105 mile per hour winds, which along with increasingly rough seas tattered the sails of the ship, and caused its boiler to fail. Knowing the ship was taking on too much water to remain afloat, Herndon flew the ship’s flag inverted, a well-known distress signal of the time. After a long night at sea, the Central America’s distress signal was noticed by the passing ship Marine, who stopped to help the passengers on board. While the Marine had enough room for the women and children aboard the ship, there was not enough space for Herndon, his crew, or most of the male passengers to escape the sinking ship. Refusing to abandon his ship with passengers still aboard, Herndon and his first mate chose to dress in full regalia, before sacrificing themselves with their ship on the evening of September 12, 1857. A painting depicting the sinking of the SS Central America. Reprinted from Mines of Clear Creek County by Ben M. Dugan courtesy of the Library of Congress (pg. 10, Arcadia Publishing, 2013). At the time of the boat’s ultimate demise, over 400 people were still on board, making it the most deadly of any American commercial boat disaster. The gold on board (valued today at over $292,000,000 USD) was also lost. The loss of this gold was a major contributor to the following Panic of 1857, as public confidence in the economy further declined. The Central America’s location was subsequently lost. In 1988, explorer Tommy Gregory Thompson led a group to search for the ship, where it was found approximately 160 miles off the coast of South Carolina. Up to three tons of gold were excavated from the ship under Thompson’s leadership, leading to long legal battles that have continued to present day. Insurers, citing their original insurance of the gold in 1857, claimed the treasure belonged to them, leading to a court case that lasted until 1996, when 92% of the gold was awarded to Thompson. He was later sued by investors and crewmen, who complained they were not paid for their work and investments into the project. After going into hiding in 2012, Thompson was captured by US Marshals in 2015, and is currently in prison. Since 2014, deep-water shipwreck salvaging company Odyssey Marine Exploration has worked to excavate the remainder of the Central America site, which they claim was only “5 percent” excavated during Thompson’s expedition. Today, the value of recovered gold from the site is estimated between to be $100-150 million USD, and is on display around the country. Which shipwreck do you think was the most valuable find? Let us know in the comments below! To learn more, check out some of our other popular books about shipwrecks in America below.